TEAM TIGER was created by Tom Patton in 1979 when he made the transition from SCCA Solo II to Club Racing. Beginning in 1987 TEAM TIGER consisted of Tom Patton of Cincinnati, OH, campaigning a 1966 Sunbeam TIGER in SCCA Club Racing and Barry Schonberger of Evansville,IN, campaigning a 1967 Sunbeam TIGER in SCCA Solo II competition. Tom's career includes numerous Solo II Divisional Championships and trophy positions at the Solo II National Championships between 1974 and 1979. As a Club Racer he has dominated the Central Division Championships for many years, as well as gaining numerous podium positions at the SCCA Valvoline Runoffs. 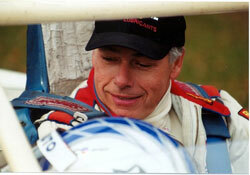 In 1999 Tom was the SCCA GT-2 National Champion at the Runoffs. The first-ever national title for the TIGER some 32 years after the car went out of production.